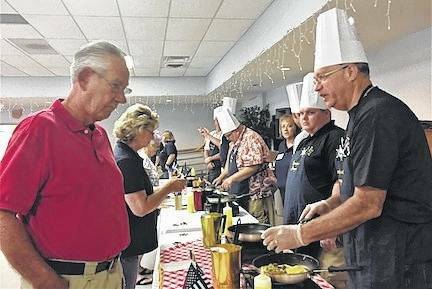 Sheriff John Hinton serving Betty Ritchey during the Celebrity Chef Omelette Breakfast held on Saturday morning. Donations continue to come in, with the total amount raised to be announced. Shown are, from left, Grange Master Lisa Tharp, whose Celebrity Chef Omelette Breakfast was her brainchild. She has been doing for the past nine years in Knox County for the County Developmental Disabilities and the past three years in Morrow County. The first two benefitted the Historical Society and this year for the Morrow County Sheriff’s K9 program; Common Pleas Court Judge Tom Elkin and State Rep. Wes Goodman. Retired Sheriff Steve Brenneman serving Joe Cook. 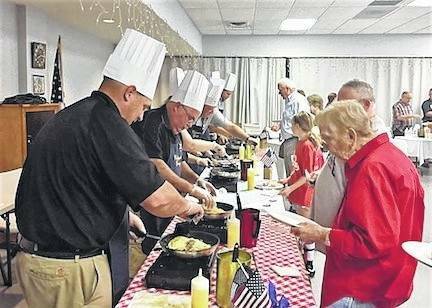 https://www.morrowcountysentinel.com/wp-content/uploads/sites/29/2017/09/web1_IMG_6251.jpgSheriff John Hinton serving Betty Ritchey during the Celebrity Chef Omelette Breakfast held on Saturday morning. Donations continue to come in, with the total amount raised to be announced. 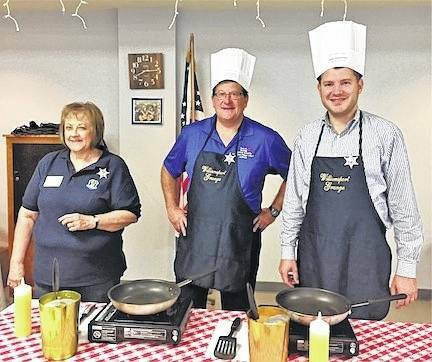 https://www.morrowcountysentinel.com/wp-content/uploads/sites/29/2017/09/web1_IMG_6252.jpgShown are, from left, Grange Master Lisa Tharp, whose Celebrity Chef Omelette Breakfast was her brainchild. She has been doing for the past nine years in Knox County for the County Developmental Disabilities and the past three years in Morrow County. The first two benefitted the Historical Society and this year for the Morrow County Sheriff’s K9 program; Common Pleas Court Judge Tom Elkin and State Rep. Wes Goodman. https://www.morrowcountysentinel.com/wp-content/uploads/sites/29/2017/09/web1_IMG_6253.jpgRetired Sheriff Steve Brenneman serving Joe Cook.